Echo Park is known for its historical architecture as it is one of the oldest neighborhoods in Los Angeles. But popping up amongst the 1920s California bungalows and the occasional craftsman homes are a few brand new, ultra-modern styles that are defining modern Echo Park architecture. The Los Angeles Times Magazine recently took notice on one such structure in an article that raved about the home's design, calling it "smart, flexible design solutions that raise the bar on the indoor-outdoor connection so essential to life in Southern California." Located on Lake Shore in Echo Park, the Ark House is an unusual site. Acclaimed for its adaptability in any season, the floor-to-ceiling sliding glass "windows" have corrugated metal screens for temperature regulation, and are removed in winter. The rest of the concrete structure is three stories, the third of which is a beautiful rooftop garden with views of Echo Park, Downtown Los Angeles, and beyond. Norman Millar, the architect who acquired the property in 1989, started the project in 2006 and completed it in 2010. 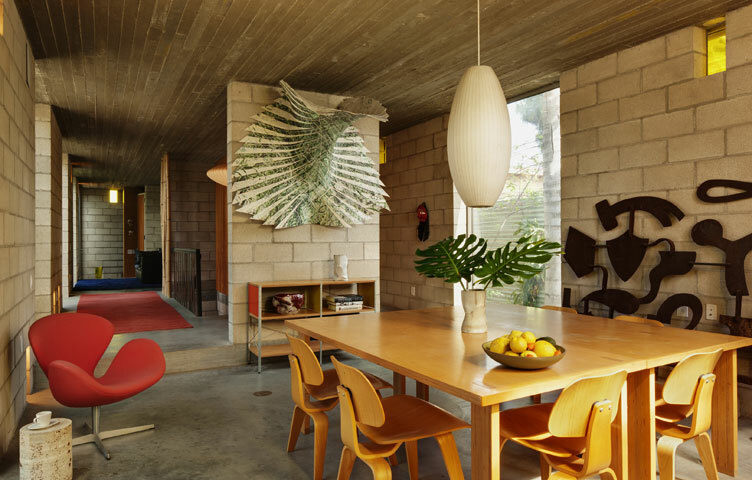 It's been a part of may Los Angles home tours, including the 2011 Dwell on Design tours.